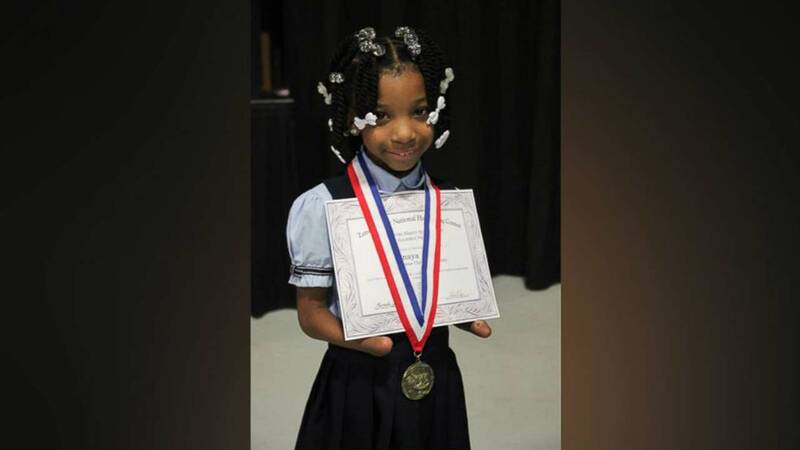 CHESAPEAKE, Va. -- A 7-year-old girl born without hands has such good handwriting, she beat out 50 other youngsters from around the country to win a national penmanship competition. 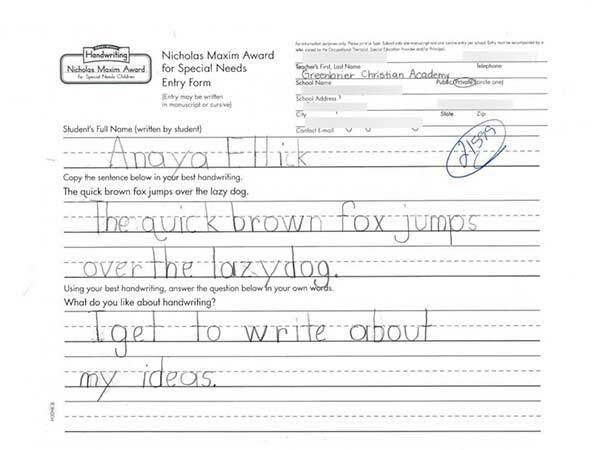 First-grader Anaya Ellick uses her forearms to write, opting to forgo prostheses. "There is truly very little that this girl cannot do," principal Tracy Cox of Greenbrier Christian Academy in Chesapeake told ABC News. Cox said it was her idea to have Anaya enter the competition, which is open to students in kindergarten to eighth grade. "She is a hard worker," Cox said. "She is determined. She is independent. She is a vivacious and a no-excuses type of young lady." Anaya's penmanship was submitted in the category that encourages the participation of students with cognitive delays, or intellectual, physical or developmental disabilities. This category is judged by a team of occupational therapists, and the winner is awarded the Nicholas Maxim Special Award for Excellence in Penmanship. This is Anaya Ellick's winning entry in the 2016 Nicholas Maxim Special Award for Excellence in Manuscript Penmanship. "We looked at her writing and were just stunned to see how well her handwriting was, considering she writes without hands," competition director Kathleen Wright told ABC News. "Her writing sample was comparable to someone who had hands." Greenbrier founder and superintendent Ron H. White told ABC News that Anaya's peers treat her no differently than other students, and she keeps up with them. "I don't think Anaya thinks of it as an obstacle," he said. Anaya's father says she is talking about taking karate and gymnastics. Her parents say they know not to doubt her ability. She plans to keep the trophy in her room and draw a picture of it.